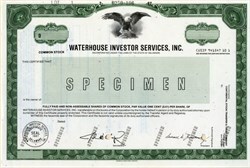 Beautifully engraved RARE IPO Specimen Stock Certificate from the Waterhouse Investor Services, Inc. printed in 1987. This historic document was printed by the American Banknote Company and has an ornate border around it with a vignette of an eagle. This item has the printed signatures of the Company's president , Lawrence M. Waterhouse, Jr. and Secretary. This is the first time we have had a certificate from this company. Waterhouse Investor Services, Inc. provides, through its principal subsidiary, Waterhouse Securities, Inc., discount brokerage and related financial services, primarily to retail customers throughout the United States. It was the nation's fifth-largest discount brokerage house in 1995. Through another wholly owned subsidiary, Waterhouse National Bank, a "virtual" bank with only one office, it electronically offers a variety of financial services and products, primarily to the customer base of Waterhouse Securities. Waterhouse Investor Services grew rapidly in the bull market of the early 1990s, a period that saw commissions collected by discount brokers rise from $613 million in 1990 (and $48 million in 1980) to almost $1.5 billion in 1994. The company was purchased in 1996 by Toronto-Dominion Bank for $525 million U.S. ($715 million Canadian) and became a wholly owned subsidiary of Toronto-Dominion. The company was founded by Lawrence M. Waterhouse, Jr., a former Chemical Bank employee who had become a financial adviser. After the Securities and Exchange Commission ended nearly 180 years of fixed-rate commissions on the stock exchanges in 1975, Waterhouse placed a small advertisement in a newspaper offering his services at a discount from the standard rate. He did well enough to incorporate in 1979 as Waterhouse Securities, Inc. In the company's first, partial fiscal year, operating out of a Manhattan office, its four account officers amassed $230,000 in commissions. In 1980 the company opened an office in San Francisco and ended the fiscal year with 13 officers and $1.36 million in commissions. The following year it opened an office in Los Angeles and ended the fiscal year with 17 account officers and $2.36 million in commissions. After a relatively stagnant 1982, Waterhouse Securities raised its commissions to $6.9 million in fiscal 1983 (ended August 31, 1983) and earned $499,090 in net income. The following fiscal year the company opened a Chicago office, but commissions fell to $5.6 million, and it lost $42,638. In fiscal 1985 Waterhouse Securities added branches in Dallas and Washington, D.C., raised its commissions to $7.1 million, and had net income of $223,575. During fiscal 1986 it opened a Philadelphia office and ended the period with 57 brokers and nearly $11.5 million in commissions. Net income was $668,128. The company reincorporated as Waterhouse Investor Services, Inc., a holding company with three subsidiaries, including Waterhouse Securities, in 1987. It went public the same year, collecting $5.7 million from the sale of nearly 40 percent of the outstanding shares at $7 a share. Most of this money was used to open a self-clearing operation in 1988 so that the company no longer would have to depend upon an unaffiliated clearing house to execute its transactions. During fiscal 1987 Waterhouse opened branches in Seattle and Miami and had net income of nearly $1.4 million. It ended the period with 70 brokers and $15 million in commissions. During fiscal 1988 Waterhouse added branches in Atlanta, Boston, Detroit, and St. Louis, bringing the total to 13 in 11 states and the District of Columbia, serving about 80,000 customer accounts. It was reaching potential customers through a combination of referrals and advertisements in newspapers and financial publications. Its three-part marketing plan consisted of a simple, level-discount commission schedule; services by personal-account officers in regional offices; and free investment and financial-publication information (but not investment advice) to customers with active accounts. In October 1987 the Dow Jones index suddenly fell 25 percent in a wave of panic selling; as a result trading was down for the rest of fiscal 1988, and Waterhouse's revenues dropped to $14.8 million. The company lost $88,000 that year, not only because of the drop in commission revenue but also due to the start-up costs of the self-clearing operation. Although commissions were still below the fiscal 1987 level in fiscal 1989, Waterhouse had record total revenue of $19.6 million because interest income came to almost $5 million, primarily from a new service--loans to customers who wanted to trade on margin. The company's net income for the year was $1.1 million. Waterhouse added a Cleveland branch in fiscal 1989, raised the number of its accounts to about 100,000, and declared its first dividend. During fiscal 1990 Waterhouse raised its revenue to $23.5 million and its net income to $1.3 million. It acquired a small brokerage operation in Kansas City, opened a branch in Houston and its second office in New York City, and increased its number of accounts to about 115,000. In 1991 Waterhouse became a hot stock, rising about sixfold from its average value of approximately $4 a share in 1990. Its customer base expanded to about 150,000 accounts and its number of branches to 30 in 20 states and the District of Columbia. Net income soared to $3.2 million on total revenue of $31.4 million. During fiscal 1992 Waterhouse nearly doubled its business, earning $8.5 million on revenue of $55.4 million. It added no-load mutual funds and fixed-income securities to its offerings and ended the calendar year with 420 employees and 39 offices in 24 states. Waterhouse was now in fourth place among discount brokers, behind Charles Schwab & Co.--by far the largest--Quick & Reilly Inc., and Fidelity Investments. Unlike the graduated commissions offered by most discount brokers, Waterhouse was offering a standard commission about 70 percent lower than that charged by full-service firms, on top of a minimum fee of $35. By the end of 1992 it was test-marketing a telephone brokerage service on the West Coast and working to develop an online service based on personal computers. During fiscal 1993 Waterhouse's revenues grew to $84.4 million and its net income to $14.4 million. The number of offices increased to 55 and the number of active customers to 180,000. The company's stock reached $36.50 a share in September 1993, making it the most highly valued brokerage stock on the market. Even with a late-fall decline in price, Waterhouse's total stock-market value was nearly three times the fiscal year's revenue, and its share price was 6.7 times book value. Overpriced Stock Service, the short-sellers' newsletter, dubbed Waterhouse its overpriced stock of the month, vulnerable to the first glimmer of a bear market. Just before the end of the year Waterhouse took on $50-million worth of long-term debt by issuing 10-year convertible notes at six-percent interest. Although there was no bear market in 1994, Waterhouse's stock came back down to earth, averaging about half the level of its 1993 peak. In the fiscal year it again set records, with total revenues reaching $107.6 million and net income $15.7 million. The number of branches reached 60 in 31 states and the District of Columbia, and the number of customers, 221,000. In October 1994 the company received federal clearance to open a new unit, Waterhouse National Bank, in White Plains, New York. This bank became operational in 1995, offering certificates of deposit and money-market accounts. It was planning to introduce a credit card and other products and services during 1996, including home-equity loans. At the end of 1995 Waterhouse National Bank had deposits of $362 million, total assets of $386.1 million, and net income of $517,000 for the year. During fiscal 1995 the total revenue of Waterhouse Investor Services reached $143 million and its net income $19.4 million, both records. The number of Waterhouse Securities branches rose to 72 in 37 states and the District of Columbia. The number of its account officers had grown to 551, compared to 103 in 1991. Waterhouse Securities was serving more than 400,000 individual investors and had about 300,000 active accounts. Of its revenue, some 79 percent came from commissions and clearing fees; 12 percent from net interest; and seven percent from mutual fund fees. At the end of fiscal 1995 Waterhouse Securities was offering a wide array of investment vehicles, including stocks, bonds, options, and mutual funds. (Among its most lucrative products were loans to customers for trading on margin, which grew to $365 million in fiscal 1995.) According to the parent company's description of its business, by maintaining a low-cost structure and utilizing a highly automated order-processing system, Waterhouse Securities could charge commission rates substantially lower than those charged by other leading nationwide discount brokers as well as full-service brokerage firms. The minimum commission of $35 a transaction had not been increased since the company's inception. The parent company, Waterhouse Investor Services, was also operating a deep-discount subsidiary named Washington Discount Brokerage Corp.
During the first three quarters of fiscal 1996 Waterhouse was on a pace to shatter its previous record revenues and earnings by a considerable amount. For nine months it had total revenue of $171.9 million and net income of $22.3 million. It regained fourth place among discount brokers in the United States, opened seven more offices by April 1996, and raised its number of accounts to 500,000. Waterhouse announced in June 1996 that it planned to open eight more offices by the end of the fiscal year and to introduce the Waterhouse Investors PC Network, offering investment and portfolio-management software. This would give customers direct access to the financial markets, including real-time quotas, trading, account information, and news. In addition the company would be introducing services that would allow customers to access account information and place trades 24 hours a day, seven days a week. In April 1996 Toronto-Dominion Bank, Canada's fifth-largest bank, agreed to acquire Waterhouse for $525 million ($715 million Canadian) in cash and stock, or $38 a share--an extraordinary amount three times Waterhouse's 1995 revenue and nearly six times its book value. Lawrence M. Waterhouse, Jr., the company's chairman and chief executive officer, was to continue heading the firm, which would be a subsidiary of the bank. Toronto-Dominion also was operating Green Line Investor Services, Canada's largest and most successful discount broker, which had expanded to the United States in 1995 under the name Green Line USA. The agreement called for payment in either cash or Toronto-Dominion shares, but there was a ceiling of about 35 percent in cash. Waterhouse shareholders electing to receive Toronto-Dominion (TD) common stock were to receive 1.87046 TD shares for each Waterhouse share, with fractional shares paid in cash. The other shareholders were to receive 67.14162 percent in cash and the remainder in TD stock, with fractional shares paid in cash. The principal beneficiary of the sale was the Waterhouse family, which held about 23 percent of the stock, and other officers and directors, who held about 18 percent. Ten thousand dollars invested in Waterhouse stock five years earlier would now be worth $488,606. The transaction also enabled Toronto-Dominion to enter U.S. retail banking by acquiring Waterhouse National Bank. However, a New York City-based consumer-activist group, Inner City Press/Community on the Move, challenged the takeover on the grounds that the Waterhouse bank had not met the requirements of the Community Reinvestment Act (CRA), which mandates U.S. banks to invest in low- and middle-income neighborhoods. In response, Toronto-Dominion vowed to increase the bank's CRA annual budget--only $350,000 in October 1995--to $7 million in 1997. Waterhouse National Bank bought $2-million worth of New York City housing bonds in August 1996 and committed itself to making $1 million in community-development loans before the end of the year. Community protests continued nonetheless, but the Federal Reserve Board cleared the acquisition in October. With the closing of the merger on October 15, 1996, Waterhouse Securities and Green Line together constituted the third-largest discount broker in the world, with more than a million customers.